The hand-drawn 2D platformer has become such a common occurrence over the past couple of years that it might as well be a genre of its own. Since its launch, the Switch has seen its fair share of these, from Hollow Knight to Toki (the latter of which was released this week). 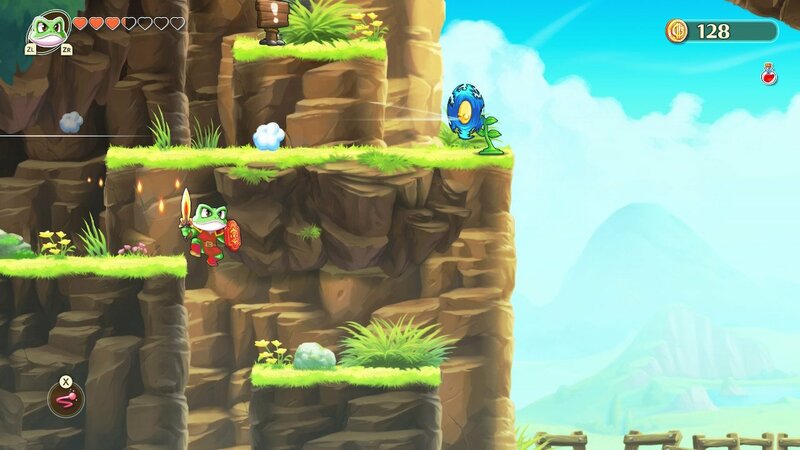 One of the most notable examples of this was last year’s Wonder Boy: The Dragon’s Trap, an utterly gorgeous remake of the 1989 Master System game. While fans and newcomers alike loved it, it would’ve been nice to have had an entirely new adventure rather than one that was nearly three decades old. 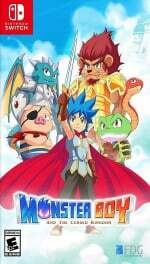 Step forward Monster Boy, a spiritual successor developed by French studio Game Atelier in collaboration with Wonder Boy’s creator, Ryuichi Nishizawa. 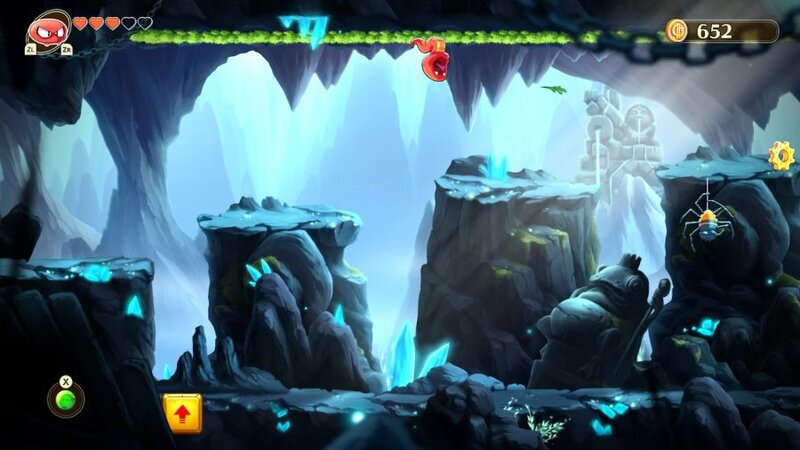 While it may not be an official Wonder Boy title, it’s clear right away that Monster Boy is a modern day sequel in all but name since its premise – a Metroidvania game starring a lad who can transform into different creatures – is taken straight from The Dragon’s Trap and should be immediately familiar to fans of the series. To be clear though, this isn’t a remake like the Dragon's Trap was. With a completely new developer comes a completely new game, and a completely new plot to boot: you play as Jin, a young chap who lives in Monster World. One day his Uncle Nabu suddenly goes mad and starts flying around, turning everyone in the kingdom into animals. It’s up to Jin to find out why his uncle has suddenly flipped his lid by collecting special sacred orbs that allow him to transform into different creatures. The first transformation, which appears around 15 minutes into the game, turns you into an eyepatch-wearing pig (a character who will be instantly familiar to Wonder Boy fans). He has a jumping ground-pound move and the ability to use magic, but he can also use his snout to sniff away ‘scents’ and reveal hidden secrets. These mechanics alone would be enough for most games, especially since each new type of magic you find – fire, lightning, tornadoes and the like – is used in different scenarios, too. As you continue to progress through the game’s enormous world map, though, and collect the various sacred orbs, you’ll add new creature transformations and be able to switch between them at will, giving you a whole host of new abilities. The snake, for example, can fit into smaller gaps, stick to walls and spit a green acid that can trigger certain types of switch. Meanwhile, the frog can use his tongue to grab grapple points, swinging and catapulting his way around the environment. By the time you’ve added the lion (who can charge into barriers) and the dragon (who can fly), you’ve got more tricks than a Las Vegas conjurer. It isn’t really until you unlock the frog ability that the game starts to come into its own, though. While the pig and snake make for some basic yet entertaining puzzles, the frog (and other transformations you get after that) can equip different weapons, boots, shields and the like, giving the game a light RPG element. It also gives you yet another set of abilities to make use of: the different types of boot alone let you sink to the bottom of water, perform double jumps, melt ice under your feet and so on. With so many different abilities and sub-abilities this could very easily become overwhelming, but Monster Boy does a good job of making sure you’re gradually introduced to them one at a time and given a few puzzles that make use of them before you find the next upgrade. That’s not to say it doesn’t eventually get a little perplexing, mind you: by the time you’re near the end of the game and armed with more moves than a chess master, you’ll sometimes find yourself stopping in your tracks and going over your huge list of abilities in your head, trying to think of the right one for certain situations. That’s the end of the game, but the beginning’s no cakewalk, either. 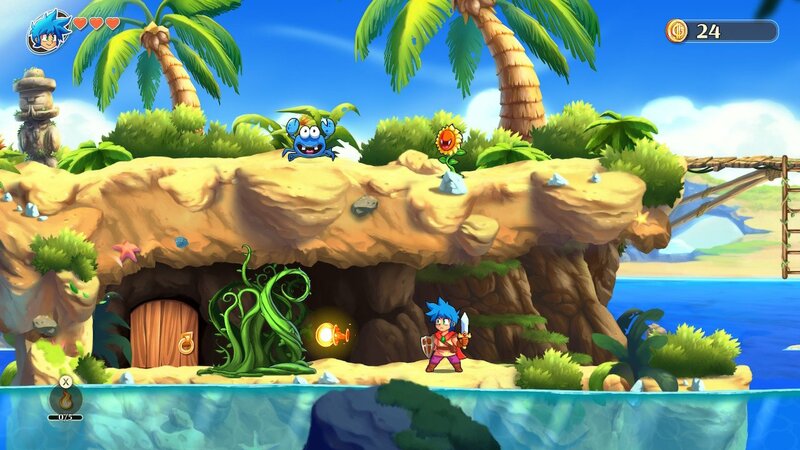 Monster Boy may be a brand new adventure but it’s still very much a homage to its Master System predecessor and it makes no bones about offering a game with a 1980s difficulty level. There are plenty of platforming sections that will potentially have you pulling out clumps of hair, but somehow it always manages to find that delicate “one more go” balance. You may find yourself spending 15 minutes trying to clear a single section with a couple of jumps, and yet the checkpointing is so generous you’ll never feel aggrieved. All this old-school gaming goodness is wrapped up in one of the most beautiful-looking packages we’ve seen in a 2D platformer. The hand-drawn locations and characters are fantastically animated (especially the pig) and everything feels like you’re conducting an episode of your favourite anime series – something which is helped by the superb animated introduction sequence, complete with its own theme music (which comes with both English and Japanese vocals, selectable in the Options screen). Speaking of the music, the soundtrack on offer here is sumptuous. With an all-star line-up of composers including Yuzo Koshiro (Streets Of Rage), Motoi Sakuraba (Golden Sun) and Michiru Yamane (Castlevania: Symphony Of The Night), Monster Boy sounds every bit as immaculate as it looks. It’s safe to say the presentation levels are off the charts here. As a retro-inspired platformer, it’s close to perfect, but not quite. Inexperienced gamers may get frustrated at the steep difficulty curve; although the game takes its time to gradually increase your list of abilities it isn’t so delicate when it comes to ramping up the pressure. As such, you can expect some fiddly jumping sections and tricky enemies fairly early on (especially given that your first form, the pig, is unarmed, making combat pretty hairy). These are really the only quibbles in what’s an otherwise outstanding game, though. 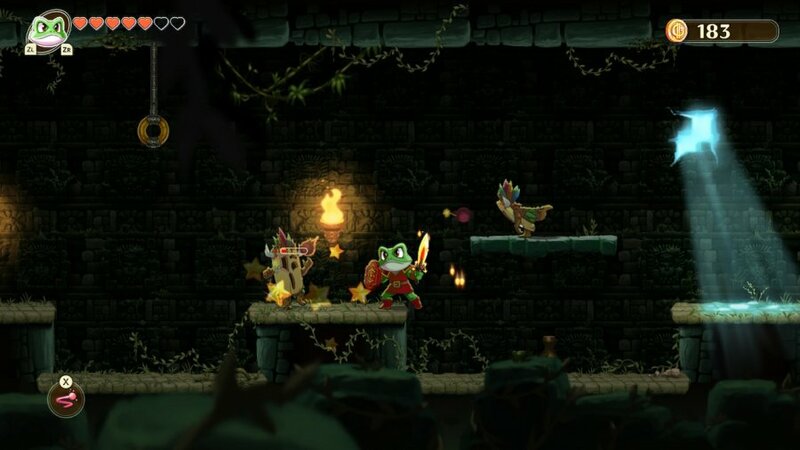 When Lizardcube remade Wonder Boy: The Dragon’s Trap that was one thing, but when a relatively small studio decided to create an entirely new game based on the series – especially one that was originally designed to be something completely unrelated and only became a Wonder Boy homage later in development – it’s fair to say many were dubious. 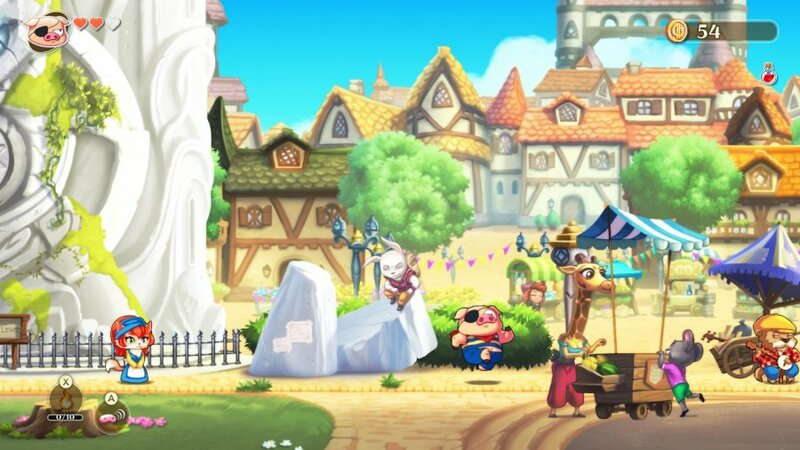 The reality, though, is that Game Atelier has knocked it out of the park and delivered potentially the best Wonder Boy game ever, spiritual or not. I'm with you on this one, Chris. One of the best games of the year! No physical release in Europe, right? Time to import! Still need to play Wonder Boy: The Dragon's Trap first but I'm importing a physical copy of this anyway and I'll get around to them both eventually. Is that rad song from the trailer featured heavily? All I have to say is YESSSSSSSSSSSSSSSS!!!! I imported the US physical version, which I'm expecting sooner than it'll come, I'm afraid. But I want it as a gift for Christmas, so I'll take it and hand it in order to really open it when the time comes. Anyway, I see in many reviews that Monster Boy (why didn't they get the rights to use the name, with the creator involved?) is a spiritual successor to the classic series, but they end up saying it's a successor to Wonder Boy III: The Dragon's Trap. Does anybody knowing other WB games know if those entries were similar to III? So this has been out almost a month already in the UK? I completely missed it! Onto the watchlist it goes, for purchase around Christmas time I guess. I thought December was going to be a relatively quiet "pick up Smash" kind of month, but it's starting to get expensive...!! OK, I've been doing a little research and I've found that the WB III reference is mainly due to the fact that this is the only entry with animal transformations, hence the comparison. Good to know. By all accounts, this is still technically an entry in the Monster World series, as it features characters, monsters, settings, and music from throughout the series. Nice review! I love the game so far. Btw you can turn the wheels off in the option mode. I just use the shoulder buttons to switch back and forth. Unless that only works for magic and not transformations? I know this sounds bad, but I just can't justify the price tag. £34.99 is a bit steep for an indie game IMO. Yes it's 20 hours long but so is Hollow Knight which is also an astoundly good game for the fraction of the price. As a gamer on a budget, I will absolutely have to wait for it to go on sale which is a shame. Definitely will be considering this one, probably next year. ugh - really like the look of this but am being put off by the difficulty level. As much as I loved playing Super Metroid and Celeste this year I really just want a good quality 2D platformer which doesn't involve a ton of back-tracking or is gonna cause me to pull my hair out in frustration. Wow!! I want that baby....but not for 40 euros. @Reverandjames You're right, but fortunately there is a physical version with the same price. The problem here is the digital version costs the same as the physical, it's not the first release with this problem, but it's a disgrace anyway. Can't wait to get this when it's half the price. Guacamelle 2 is about £18. When they are both modern 2D actions/rpg-lite games - what makes this cost double? Looks gorgeous I can’t wait to try it. And I love old school. Got my physical copy today. Can't wait to play it. Been following this through development for what seems like ages. Eh? I think you'll find that Wonder Boy has been around a bit longer than Ben! @Moroboshi876 I'm all digital with my Switch, but I have had a problem with physical cartridges costing a lot less than digital. I've had to wait for sales and sell my physical copies in exchange for the digital version. With people still being very much interested in having physical game collections, I think the choice you make shouldn't be down to price. When I saw the trailers I thought this looked pants but i'm really loving this game. Played a good few hours, on the Pirate Ship just now. The power ups come thick and fast, lotsa weapon/gear upgrades to unlock too. Absolutely stunning graphics and a its joy to hear modernised versions of WonderBoy in Monsterland (my fave Master System game) choons. Hard to fault ... The price is pretty steep though and i'm pretty sure the PS4 version is cheaper (again). Really wish the boxart/trailer didn't show all the characters you unlock .. woulda been nice to be surprised. Still, this should be a no-brainer purchase for any Metroidvania fans. Just ordered from Amazon US for delivery Monday. Don't tell the missus. @Reverandjames all my digital purchases are cheaper than physical. Just make an accoutn in norway. I can get this game for 32€ there as opposed to 40€ if i buy it in my own country's eshop. @Reverandjames I'm all about people having a choice, but they can't keep fooling us with digital games costing the same or more than physical copies. Distribution and manufacturing costs aren't the same, so they try to fool us. And they achieve it when people buy digital for 40 in cases like this. Why bother when people comply? @Banemus Of course, but that's not the point. The point is you have to resort to Norway (a few weeks ago it was South Africa) in order to get it for 8 euros less than physical. It's a shame anyway. The problem is the starting point, the price they're trying to charge us. Highly anticipated by me, after playing Wonder Boy III: the dragon's trap last year. Couldn't wait for the review either, already ordered/imported via Amazon. Looking forward to this one. In the meantime, I hope to be playing the Wonder Boy games on the Sega Megadrive collection, which is coming out for Switch tomorrow! @Reverandjames Yea, I hear you. I didn't spot the price tag until you mentioned it... Will wait hopefully for a January discount. @Banemus I've thought about doing this and I appreciate the tip, but I really can't be bothered with changing my accounts around and loading a Revoult card with different currencies. Also, the region with the cheapest prices changed a lot. One week it's South Africa, the next Russia etc. @Moroboshi876 Oh, I totally agree with you. Digital should be cheaper. I feel like we get taxed on Switch versions of games that are available on other platforms because it supposed to costs a lot more to put games on the Switch cartridges and then we get double taxed if we want to go all digital with games. It's a double standard. It's probably better than Wonderboy, but I liked its art style more. It had that Eurocomic vibe to it (with a bit of manga inspiration) and the pastel coloring really added to it. This one looks more like generic pseudo-manga. Looks great and I will be pick it up at some time next year. @nocdaes I was expecting it to be around the £20-25 mark so I was quite surprised when I saw it for 35. It looks really great, As was the previous game on Switch. I’ve been a fan of Wonder Boy/Monster Boy since playing the original game on the Sega Master System. The series has such a weird history, With many different versions of the same game appearing on multiple systems, With different names attached. Can’t wait to play this, But as others have mentioned, The price tag is a bit too steep at this time of year. Mabye after Xmas. @Lordplops Your secret is safe with us. I don't have a problem with the price tag personally. If it was eShop exclusive I'd be waiting for a price drop but it's about the standard price I expect to see for a physical version. @Reverandjames Yep, that's exactly where I'd price it too. I'm happy to wait as I have a crazy backlog (don't we all?! ), but I 100% agree with you that it's a shame because it does feel like you're being priced out. But hey, if people can happily pay that price, then all the better for the Developer. January sale is surely a given, especially since it launched in November in the UK. If this had been £19.99 for us in regions said game is only getting a digital release I think that price point would have been far, far more tempting. I'm far more digital than physical with the Switch, but on games priced more attractively. Anything £30 upwards I buy physically where possible, where not I leave it. Somehow, I don´t like the art design. Characters and environment won´t fit together IMO. Like in this Toki remake. Characters are drawn in a different way than the environments. And the animations aren´t the best either, IMO. Not as fascinating as, for example, Rayman Legends or Steam World Dig 2 etc. Maybe the gameplay is nice, but the look won´t appeal to me. Excitement levels have now reached 100%. Overload! Overload! Overload! This game looks shockingly good. Probably won't get to it until next year but glad to hear it's a solid title! Excellent review! can't wait till I get my hands on it. Can't wait to play this! My pre-order should come in today. Also, what a legendary lineup of composers! Curious to know if this title could be an underdog of the switch, since it is being released a few days before Smash Bros. Hopefully it will get some support in the way of DLCs and added content. @DMCumbo Cheers for the heads up: that option completely passed me by somehow. We'll edit the review accordingly. Good stuff, going to get around pre-ordering a copy via import. Why must the Switch be us a drain on our bank accounts? Got the physical game yesterday. The productuon value is easily on par with major 3rd and 1st party offerings. With the level of polish and care evident here, its hard to even view this as an indie game. And... the physical edition (from Amazon pre-order at least) comes with a full color mini manual! Manual whiff lads... manual whiff! Everyone is giving this game a great rating, but I knew it would be great when it was announced. Yeap definitely buying this one physical. Sheesh, I'd play this just for who the music composers are, wow. Already have my physical copy! I was unexpectedly hooked on Dragon's Trap remake when it released. This is a top pick for me. @AcesHigh MANUAL!? That's amazing....ahh, that smell.....opening this will be quite special. Yeah, it's hard to call a game "indie" when the original creator from Sega is on board, and it has an all star music team from Sega and Konami. Looks fantastic, it really does. But I can't help but feel that the price is a little steep. Will add to wishlist, and wait for a sale. I will definitely get this at some point. It looks amazing. That price looks way too steep for a game like this. Care to elaborate on that opinion? I'm not trying to instigate anything, I'm genuinely curious as to what makes this worth less than, say, your Call of Duty's or Assassin Creed's. As for me, I've already thrown this on my wishlist and will get around to it a few months from now when my honeymoon with Smash is over. It looks and sounds great! Seriously, It's a great little mini manual, full color. Reminds me of the ones that came with Gameboy Advance games back in the day. Ahhh... and that sweet huff of freshly opened full color manual literally hurled me back to 1995. 1. It all comes down to value. The production value here is head and shoulders above 95% of the indie offerings on the market today. The level of talent and care invested in the graphics, gameplay, cutscenes, level design, overall game structure, etc. is what I would expect from Sega or Nintendo 1st party and their best 3rd party efforts. The packaging is BETTER than 1st party efforts just by virtue of what it includes. All for $39.00 (I think i actually got $6 off as pre order). And its not even a "special edition" I dont believe. I would gladly pay $39 for one of these games than the $60 for the garbage pile of 5 to 10 indie games that I played once and will never touch again. 2. Those of us who see this value need to purchase this game to send a message to developers and publishers to show that the investment in highly talented graphic artists, sound engineers, level designers, game designers, product managers and commercialization experts (packaging, promotion, etc.) - as opposed to throw away, 8.5 bit one or two man projects - is wanted and desired. My .02 on an incredibly beautiful, fully packed and well balanced product offering for $39. Kudos! So happy that this came out great! 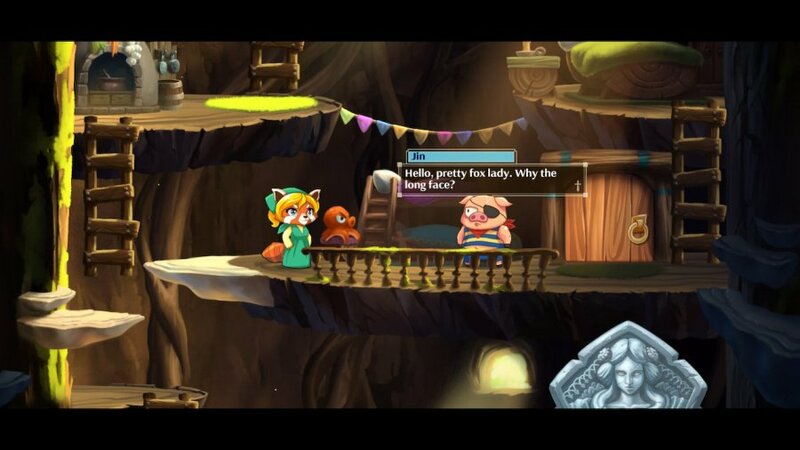 And that's OBVIOUSLY a red panda lady, and not a fox lady, but I'm sure she's about to tell him off for that herself. yes it 35 but its a brand new wonder boy game and its the best one, Worth ever penny. @Frenean Perhaps I should rephrase. The game looks great and I don’t wish to devalue the studio’s hard work. I just don’t feel this game is priced competitively enough compared to its contemporaries. When games like Hollow Knight and Owl Boy are priced no higher than 30, this looks to be a tough sale. It also annoys me that this game likely would have priced significantly lower if there wasn’t a boxed copy out there. Hope that clears things up. @AcesHigh Honestly, I find it baffling that many would write this off as "another indie metroidvania that's more pricey than other indie games". The outstanding legacy of Wonder Boy/Monster World is obscured in our current gaming generation. Game Atelier is very lucky to get help from the original creator of the series and several prolific composers. The 5 years of development has really paid off, you can tell a lot of passion has been put into it. I cannot recommend this game highly enough. Looks great, sounds great. I only wish they would have retained the purely cosmetic but still cool option to play as a Wonder--er, Monster Girl. Think I'll play Hollow Knight and Owlboy first due to the price but don't worry am sure it will be in a sale before you know it. Got my physical copy from ebay today, paid when the 10% off code was running, still not cheap for this kinda game but still worth it. People need to just say no to these ridiculous prices for eshop games. I couldn’t believe it when I saw it for 35 quid- absolute joke. If it doesn’t sell, they will get the message. It seems though that some will pay any price for any game digitally. This is like a digital album releasing at £25 just because the vinyl is that price. Stupid. @Realy_Till it is more expensive though. Is it really double the price of something like Hollow Knight better? It would sell way more at under £20 which a game with a 15-17 length should cost. @darthstuey It’s actually more than double the price of Hollow Knight. That is unfortunate because I was really looking forward to playing this. Part of the reason for the high price, I assume, is because you can buy this one physically as well. Can't really argue with that, though I would say that I would have gladly paid more for Hollow Knight and Owlboy. I know they were released on PC first, but they're some of my favorite games this year and Hollow Knight is one of my all-time favorites now. @Frenean I would buy Monster Boy myself even with it's asking price because, honestly, it does sound worth it. However, I was hoping it'd be no higher than $20 because of my backlog. That means this goes on the backburner until a sizable price drop, but that's just me. True, it's going to have to sit on my wishlist as well. If it was $20 I probably wouldn't feel as bad about buying it just to shelve it, but my '19 resolution is to focus on my backlog and not impulse-buy so many games. @darthstuey I understand that people would be turned off by its price as there are similar games that are offered for a much lower value. I cannot comment if it is better than Hollow Knight as I have yet to play that. I can attest however, that Monster Boy is one of the most enjoyable games I've had in a long time. It is the Switch's "Symphony of the Night". I've seen player's 100% completion time range from 24 to 33 hours, so that should give you some insight of the game's longevity. Every aspect of Monster Boy is of very high quality. I'd wholeheartedly encourage you to reconsider your stance on purchasing it, and get the physical copy if possible. Wonderboy games aren’t Metroidvanias, so don’t be afraid. I’m just past the halfway mark and finally stuck in a part. So, mind the progress before my opinion: It picks up 25% of the way through and becomes addictive. It’s good, so far. I prefer the art design/direction and the musical arrangements and instrumentation of the Lizard Cube remake, by far. Also, the controls on Monster Boy are not as tight. That aside, getting into it, it’s on par, if not, better. I would like to see both development teams work together on a game, someday. Also ran, if anyone knows how to light up the room inside of the Sphinx, feel free to hit me up and shed some...erm...light. @Realy_Till I think we are definitely seeing a generational divide in gaming now where value is placed differently depending on the market segment. Some place value on quality, some on quantity bundled with price. Not being too general (there are plenty of exceptions I'm sure) but it seems to be generational. Could be that the generation that grew up in the 80s and 90s are used to seeing pretty much fixed pricing per game cartidge (every game on the shelf with very few exceptions were the same price per system). And also have already seen the level of quality in most of todays indie games before in previous generations of systems. And gamers born new millennial and later have grown up with the vast selection and pennies-on-the-dollar pricing of indie games. Either way its really interesting to see that gaming is truly main stream. Back in the 80s and 90s, the market was made up of mostly one segment. Now its truly like music where many generations have their specific tastes in not only content but also delivery. Personally, I will always buy complete albums on CD (or even vinyl) and rip them to my devices where as the next gen are happy downloading single songs for .99! Great game. Right up there with Hollow Knight which is no faint praise. A slight segue from those things, I want to say it was around 2004-2006 when everyone in the record industry (from production to retail) that wasn't an RIAA representative nor Lars Ulrich, began recognizing that video games were leaving no room in a High School to College aged customer's budget for film and music entertainment. These industries seemed to have sorted themselves out since then. I sunk more time in Monster Boy today. This game is goooooood. This has been one of my most wanted games for ages. Glad that it turned out great. Long live wonderboy! Nice review and nice score. I'll download it someday.